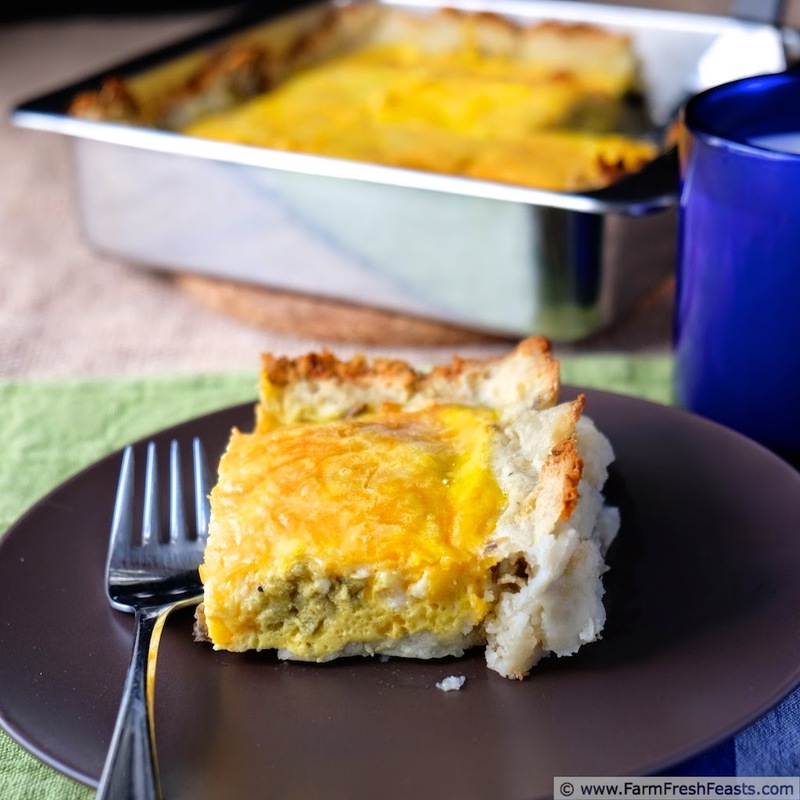 Breakfast casserole of eggs spiced with Hatch chiles in a mashed potato crust. I'll admit years ago I thought all the Hatch Chile Madness was a bunch of hype, but sheer laziness compelled me to try them after we moved here. See, my local grocery store fires up a round roaster in the parking lot each August and sells quarts of freshly roasted Hatch chiles. [Um, if I don't have to do anything more than walk the dog a mile down the road to buy a quart of already roasted chiles . . . why would I expend more energy? Laziness!] Then I found out they taste really good, too. I must point out that I've not been compensated to rave about these chiles--I bought mine on my own dime because I was curious and lazy. 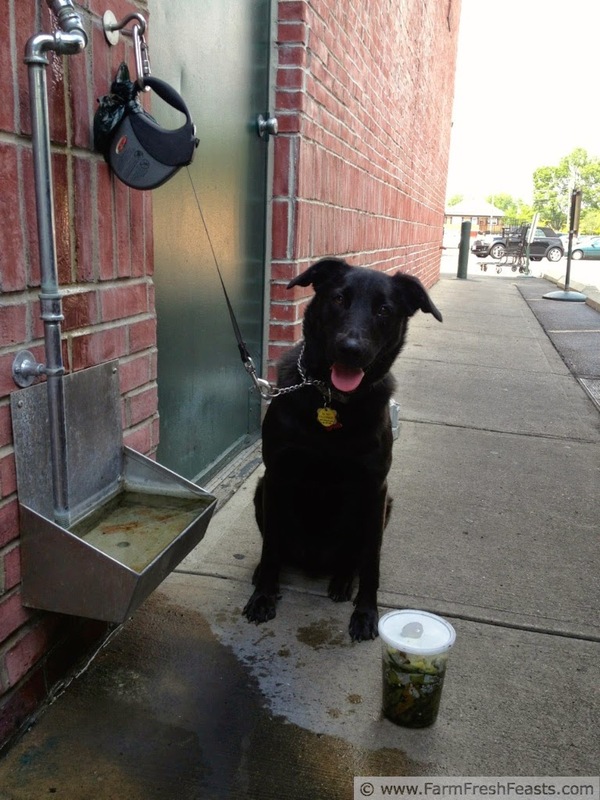 Simon came along for the ride--and because he likes to get a drink halfway through his walks. Year 1, I used some of the quart of chiles to make a batch of salsa verde along with the tomatillos from our Community Supported Agriculture (CSA) farm share, then gave the rest of the quart to our neighbors. Silly me. Year 2, I bought a quart, made my batch of salsa verde, and froze the rest, sticking them into chili here and there. Year 3, I picked up 2 quarts, made lots of batches of salsa verde, and stuck chiles in a whole host of dishes (listed below). This year, Year 4, I will be buying 3 quarts. When will it stop? The recipe I'm sharing today is great for breakfast or dinner. 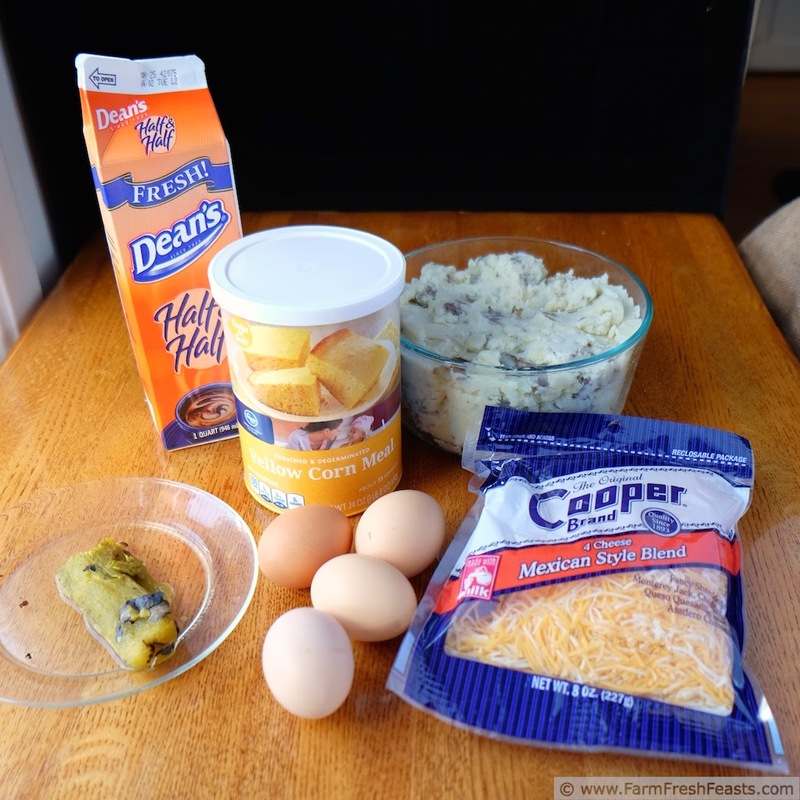 The only crazy thing is that it calls for leftover mashed potatoes and my family usually inhales my Make Ahead Irish Mashed Potato Casserole so I never have leftovers to play with unless I resort to trickery and deceit [which I did, hence this recipe]. I just had the idea that using potatoes instead of a pie crust or bread cubes would make a tasty, and gluten free, breakfast casserole. It does. I've made this both in the oven and in my bread machine. I recommend baking it in the oven primarily for ease of serving. I mean, dumping the loaf of bread out of the bread machine is one thing, but a layered casserole? What was I thinking? Preheat oven to 350 degrees Fahrenheit. In an 8 inch square baking pan, press mashed potatoes on bottom and up sides. Bake for 20 minutes. 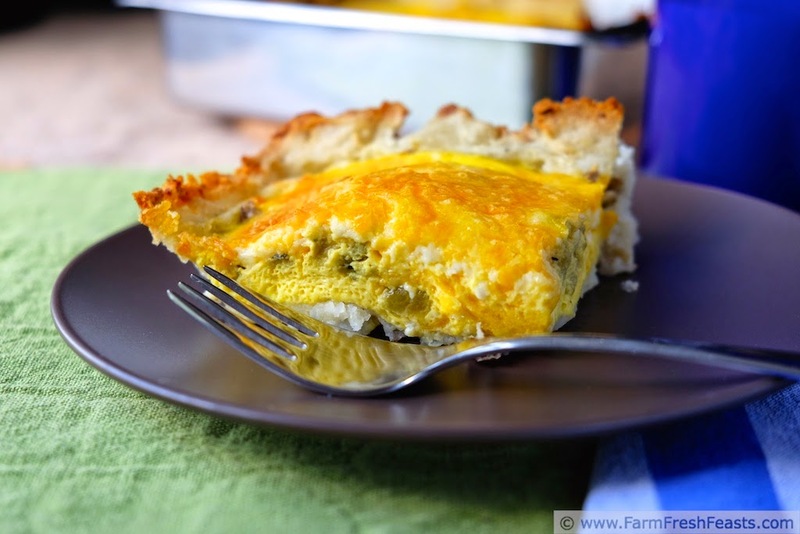 In a large measuring cup or medium bowl, whisk together eggs, half and half, and cornmeal. Set aside. Scatter chiles across potatoes, top with ¾ cup shredded cheese. Pour eggs over, and top with queso and the rest of the shredded cheese. Bake for an hour until the eggs are set. Hmm, I'm feeling another Clickable Collage coming on . . . They are such useful peppers! I like trickery and deceit. Those are my specialties. Thank you for the explanation on Hatch Chiles; I've never had them before and was always curious because I've seen them in a lot of your recipes. I hope you have many happy recipes with your chiles! I've never met an egg casserole I didn't love. And Hatch chiles -- oh my. 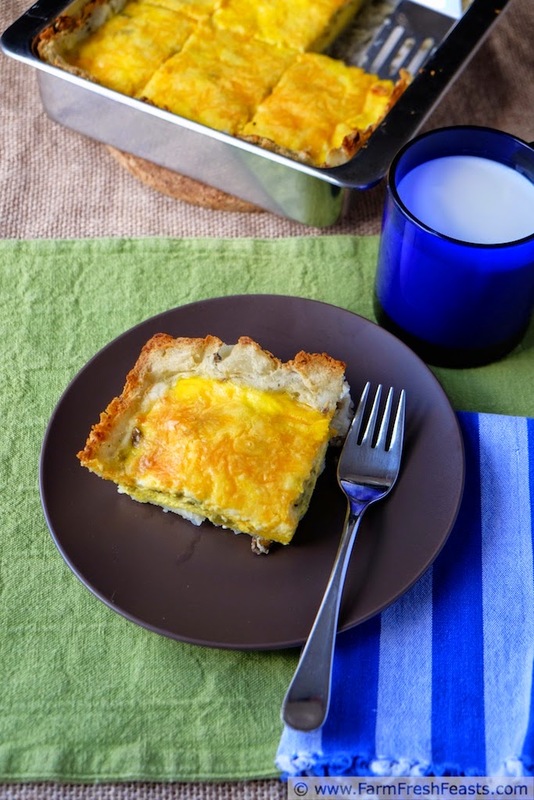 Judging by your Pinterest board, you've met a lot of egg casseroles so that's saying a lot! What a great breakfast. Dare I say I have never yet tried a hatch chile? I know. I need to do that. And this would be the perfect recipe! Until I moved a mile away from a grocery store that brought a chile roaster and a truckload of Hatch chiles up from New Mexico each August, I'd never tried one either. Their flavor is wonderful, so I understand what all the fuss is about now! I love Hatch green chiles but never see them here! I might have to order some online. 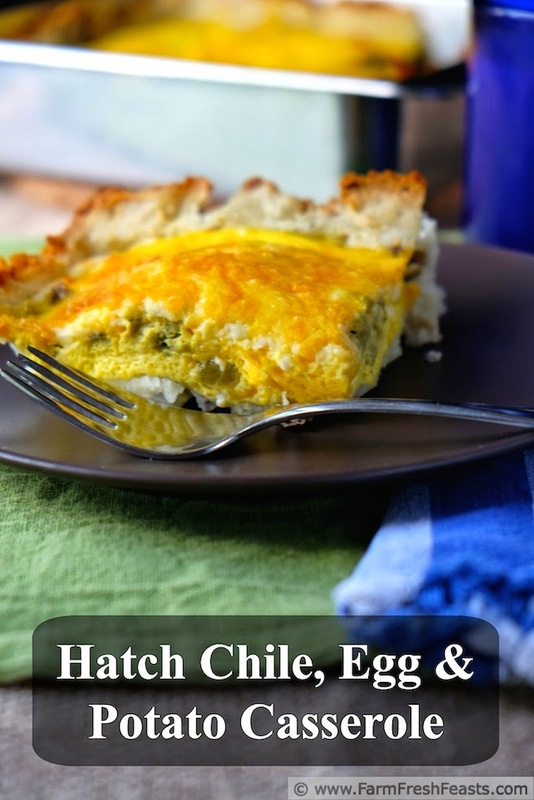 I keep seeing all these yummy Hatch green chile recipes that are making me want them! They really are SO good!! I don't really follow why groceries seem to order and which don't. Had I looked while living in Northern VA, I would have seen that Wegman's got a truckload. But I didn't know. Had to move closer to NM (?) to find them! I haven't really worked with almond meal as a grain alternative so I can't really advise. Since there's only a tablespoon of cornmeal in this recipe it is really acting like a thickener. I think I'd just leave it out, and perhaps mixing a quarter cup of additional mashed potatoes into the egg and cream mixture to thicken it up. Good luck, and thanks for your comment!